Five hundred forty seven photos later, I’m home from Alaska, still marveling at the stupendous scenery that greeted us every single day. There are many mighty mountains of course, but the combination of sea and snow-capped peaks, the glaciers, the wildlife and the vast green virginal spaces made this trip exceptional. As the kids would say, it was awesome. The trip was also special because I was traveling with my daughter,Terry, who moved with her family to Florida several years ago. It was a rare chance to be together. Wanting to see both Denali National Park and the Inside Passage, we chose a-cruise package that took care of the logistics. 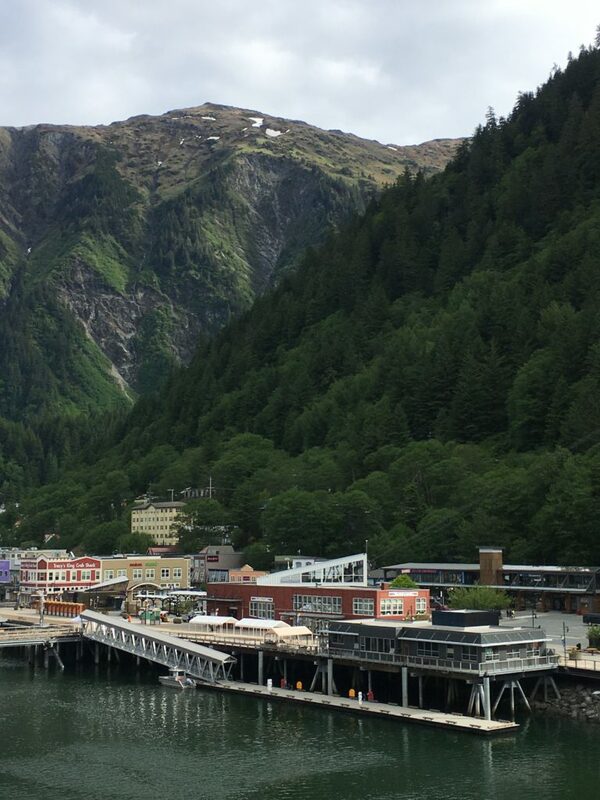 In Vancouver we boarded Holland America’s Noordam for seven days sailing the Inside Passage to Seward, where a bus was waiting for the long ride to Denali. After two nights in the park, a domed sightseeing train brought us to Anchorage for a final day before flying home (Terry’s comments are in italics). Each cruise port offered mountain vistas, but each had a distinct personality. 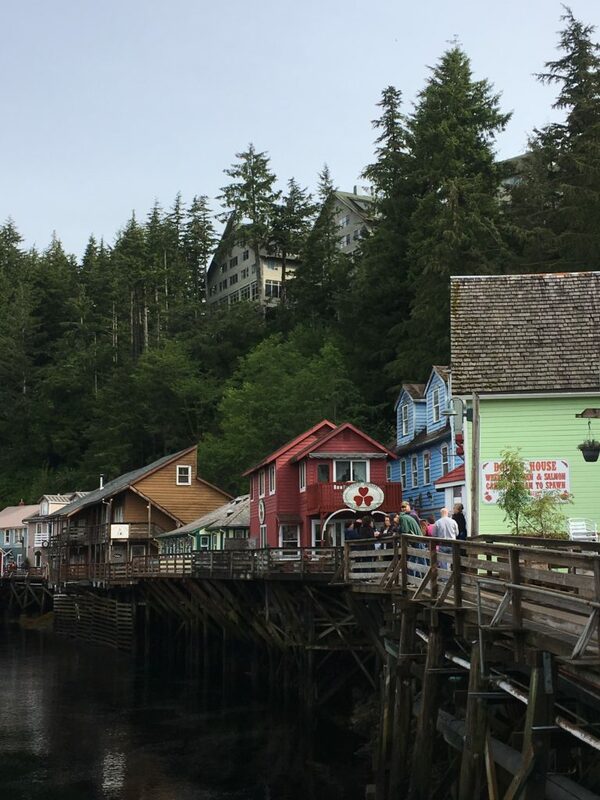 Ketchikan, with colorful wooden homes climbing up a steep treed hillside and along a rushing creek, has several claims to fame:, King Salmon Capital of Alaska, world’s largest collection of totem poles and unhappily for tourists, Alaska’s rainiest city. A rain pole downtown shows the record year, 202 inches. With the good luck that stayed with us for days, we had rare bright sunshine. The walking tour map available at the tourist bureau took us past many totems in town, to the fish ladder where salmon would be running later in the summer and to the Totem Heritage Center to see a rare collection of 19th century totems rescued in the 1970s from deserted Tlingit villages A highlight is Creek Street, where a thriving red light district once serviced workers who came for cannery. lumbering and mining jobs. The home of the most famous Madam. Dolly Arthur, is open for tours. Both the downtown and Creek Street in Ketchikan are National Historic Districts. I feared that several cruise ships in the harbor would mean crowds in town, but here and on every stop, most passengers seemed to be away on excursions, leaving the town to strollers Perhaps that was because we chose early June before peak season. Because we are both huge fans of folk art, we decided not to take an excursion in Ketchikan so we’d have plenty of time to explore the totem poles and local culture. There are totems all over town and the Totem Heritage Center ties everything together with the history of why they exist and what they mean. I was impressed that here in Ketchikan, and throughout all our stops, the native American history is so prevalent, and very much alive as part of daily life in Alaska. Our docent at the Center was a young Tlingit tribesman and it was clearly a pleasure for him to talk to us about his people’s history and customs. Juneau, named for gold prospector Joe Juneau, was thriving in the late 1800s with three of the world’s largest gold mines. It was named the capitol in 1906. 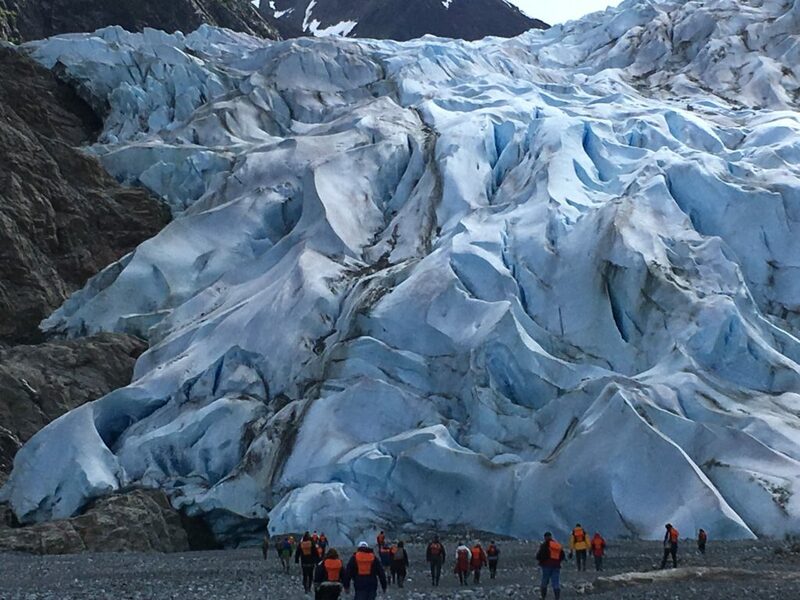 For tourists today, it is a fairly modern small town whose main lure is the excursion to Mendenhall Glacier, one of the largest and most accessible of Alaska’s massive walls of ice. The U.S. Forest Service has an excellent visitor center here with a film and a map of short walks and hikes. We added a whale-watching cruise in the afternoon and we did spy whales, though only fins and spouts, no dramatic breaching. Juneau’s other big attraction is the legendary Tracy’s King Crab Shack, where we joined the line for the biggest, meatiest crab claw I’ve ever seen. Tracy’s was a highlight of the trip! The crab legs were HUGE and succulent! I also loved seeing the historic Red Dog Saloon which is a nod to Juneau’s colorful past from mining days. You could almost see the prospectors sitting at the bar! I had no idea what to expect from this state Capital, but I’d say it’s certainly the most unique I’ve seen. The location is so remote, there are no roads. They say there’s only three ways in, boat, plane or birth! The look of the past is beautifully preserved in Skagway’s compact downtown which is now the Klondike Gold Rush National Historical Park. The high point of our cruise was the Glacier Point Wilderness Safari out of Skagway. A 60-minute catamaran cruise through the Lynn Canal, North America’s longest fjord, took us to Glacier Point Beach for a picnic lunch. 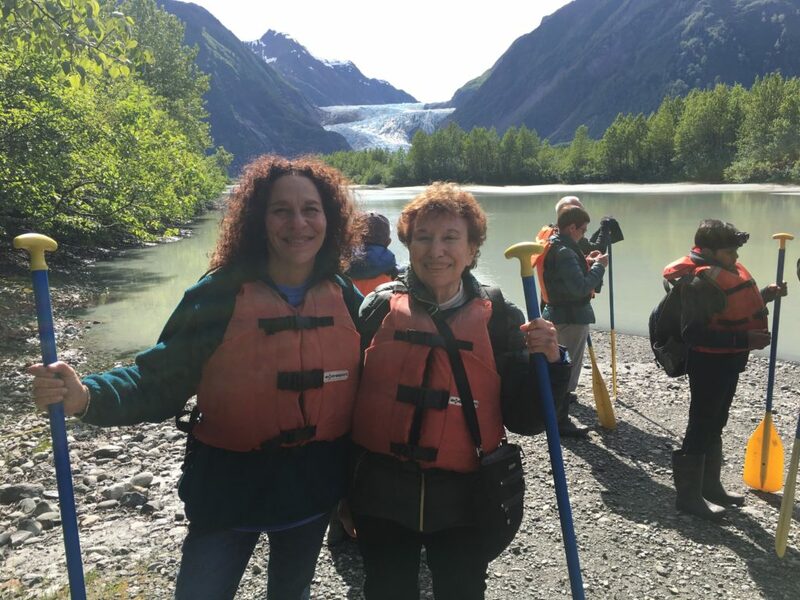 Afterwards, outfitted with rubber boots and life vest, we did a short steep hike to the Point to board big canoes bound for the deserted shoreline before Davidson Glacier. Another trek over glacial rocks brought us right to the face of the glacier, able to see and actually feel the surface of the ice. To cap it all, on the boat ride home we spied a bear on the shore, a pair of eagles’ nests, and a rookery where hundreds of sea lions were basking on the rocks. When we docked in the morning in Skagway and I looked out the window the first thing I saw was an eagle – and that was just the start to the day. As the depot for the White Pass Railroad where prospectors headed north into the Yukon, most tourists take the train ride through the mountain pass. We opted to take the Wilderness Safari and it was truly amazing. The scenery was pristine and the hike and canoe ride were a lot of fun. But standing next to that glacier, dipping your fingers into the ice, now a rushing river, and witnessing the spontaneously-created waterfalls from deep within the ice walls was incredible. Seeing those sea lions, hundreds of them, just hanging out in their natural setting and toping it off with a vivid rainbow from the water to the sky made this day one I will never forget! The next day was spent cruising Glacier Bay, an opportunity to sail close enough to hear the thunderous sounds as the glaciers “calved,” cutting off chunks of ice that float away as ice bergs. National Park Service rangers came on board to narrate what we were seeing in the morning and to offer talks on a variety of topics in the afternoon. I think we thought we’d seen it all and were a bit blasé about Glacier Bay – until we got there! Wow, the glacial calving is truly a sight to see. The sound it makes is like nothing else. Our last day was at sea sailing north toward Denali. Kudos to Holland America for keeping things interesting on board throughout the cruise. Along with the usual activities, an alliance with Microsoft meant workshops of real value to anyone with a PC, an agreement with the New York Times brought a daily small edition and the chance to read the entire paper on line without using expensive wi-fi minutes. Oprah’s Book Club provided copies of a recommended book and the chance to meet and discuss it the last day. Cooking demonstrations and a kitchen tour were also welcome diversions. I was impressed by the entertainment on the ship. I had expected it’d be terrible, but the BB Kings Blues Band was great, and both the comedian and magician were very funny and put on excellent shows. I was also impressed by the Lincoln Center classical group. They were extremely talented and added a sophisticated option for guests. 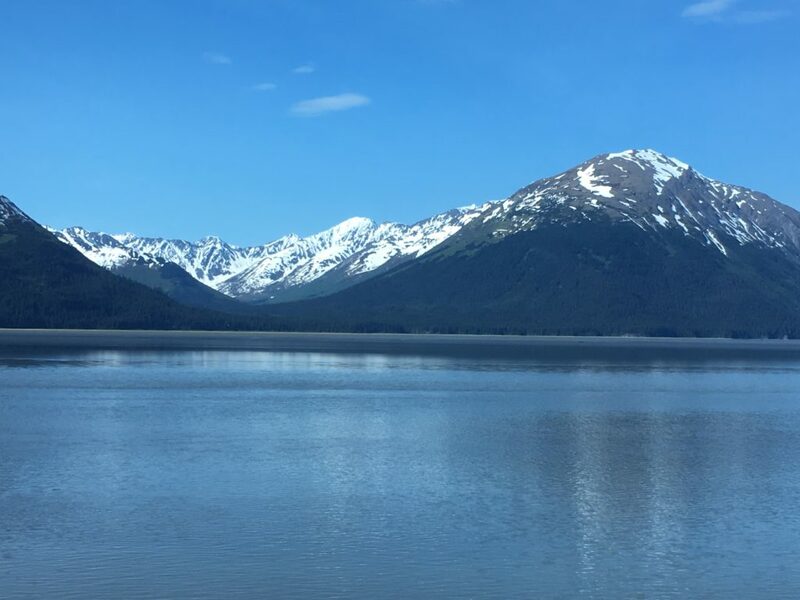 It is an eight-hour drive from Seward to Denali, but it is broken up nicely with stops to see the sled dogs at the Iditarod Center in Wasilla, a scenic lunch break, and a visit to Alaska’s impressive veterans’ memorial. Holland America’s McKinley Chalet Resort is a collection of comfortable rustic lodges at the edge of Denali National Park. A shuttle connects to the main lodge and to Denali Square for shops and a variety of dining and take-out food at moderate prices. Denali National Park and Preserve is huge, some six million acres of mountains and wilderness, roughly the size of the state of Massachusetts. One sixth of that acreage is covered by glaciers. Part of a 600-mile chain of the Alaska Range, the park boasts the tallest point in North America, 20,310-foot Mount Denali (known as Mount McKinley until 2016, when it reverted to the original native name ) There are no lodgings in the park except campgrounds and only the first 15 miles of the 92-mile park road are open to the public. Hikers can take special transit buses but most visitors visit the park as we did, on old tan buses with a naturalist on board and many stops for scenic vistas.. The number of buses is limited so the road seems empty, with no traffic to intrude on the experience. The weather gods deserted us at Denali and on June 11, we had dark heavy clouds, snow squalls and temperature in the 30s. There wasn’t a prayer of seeing Denali’s peak. Even so, it was inspiring, raw nature on a scale rarely seen, a memory to savor . The conditions also limited our wildlife sightings, but we did spy a moose and its calf close up, and had distant sightings of a grizzly bear, mountain sheep and caribou. Binoculars are definitely advised! What can you say about this expansive and unique national park but wow! Our bus driver/guide was so knowledgeable and we were all keeping our eyes focused for wildlife. Cameras on the bus allowed extreme close-ups of animals too far to see with the naked eye. Bears, Moose with cubs, Caribou, Mountain Sheep, a wide array of birds and a very rare Black Fox allowed us to check off all our wildlife boxes. That evening was a treat, a visit to Husky Homestead, where four-time Ititarod champion Jeff King now trains racing dogs. We learned what it takes to prepare both dogs and humans for the grueling 100-mile race in Arctic weather. We saw the young dogs learn to build endurance in a device like a giant hamster wheel, and go for training runs. Best of all, we had the chance to hold the adorable puppies. Though it was evening, we saw it all in daylight, which lasts until almost 11 p.m. in June in Alaska. I am so glad we did this. We learned about how these dogs are bred and trained – and how the mushers work with the dogs to manage this 1,100 mile race through the wilderness. We got to meet two young mushers who now compete – one is from Alaska and was raised with sled dogs his whole life; the other a recent transplant from Atlanta who had never seen snow but is now hooked and lives here year-round. Overall it was so interesting to meet all people who run the tours, provide transportation and who have made Alaska part of their lives. People from all over the U.S., seeking out different ways of life. Some came for a summer and never left, some come every summer and live in warmer climes, some were born and raised here. But all share the love of this unique and magical place called Alaska! By the time we boarded a domed sightseeing train the next day for the long ride south to Anchorage, the incredible scenery out the window seemed almost routine. We did have sunshine again, so one last chance for photos. Anchorage is a small city, a gentle but still unwelcome return to civilization. I’m happy to have every one of my photos to bring back the beautiful memories. This truly was a trip of a lifetime, and made much more special by sharing it with my mom!